Astronomers have long puzzled over why a small, nearby, isolated galaxy is pumping out new stars faster than any galaxy in our local neighborhood. Now NASA's Hubble Space Telescope has helped astronomers solve the mystery of the loner starburst galaxy, called NGC 1569, by showing that it is one and a half times farther away than astronomers thought. The extra distance places the galaxy in the middle of a group of about 10 galaxies centered on the spiral galaxy IC 342. Gravitational interactions among the group's galaxies may be compressing gas in NGC 1569 and igniting the star-birthing frenzy. "Now the starburst activity seen in NGC 1569 makes sense, because the galaxy is probably interacting with other galaxies in the group," said the study's leader, Alessandra Aloisi of the Space Telescope Science Institute in Baltimore, Md., and the European Space Agency. "Those interactions are probably fueling the star birth." The farther distance not only means that the galaxy is intrinsically brighter, but also that it is producing stars two times faster than first thought. The galaxy is forming stars at a rate more than 100 times higher than the rate in the Milky Way. This high star-formation rate has been almost continuous for the past 100 million years. Discovered by William Herschel in 1788, NGC 1569 is home to three of the most massive star clusters ever discovered in the local universe. Each cluster contains more than a million stars. "This is a prime example of the type of massive starbursts that drive the evolution of galaxies in the distant and young universe," said team member Roeland van der Marel of the Space Telescope Science Institute. "Starburst galaxies can only be studied in detail in the nearby universe, where they are much rarer. Hubble observations of our galactic neighborhood, including this study, are helping astronomers put together a complete picture of the galaxies in our local universe. Put the puzzle pieces in the right place, as for NGC 1569, and the picture makes much more sense." Aloisi and her team actually discovered the new distance by accident. 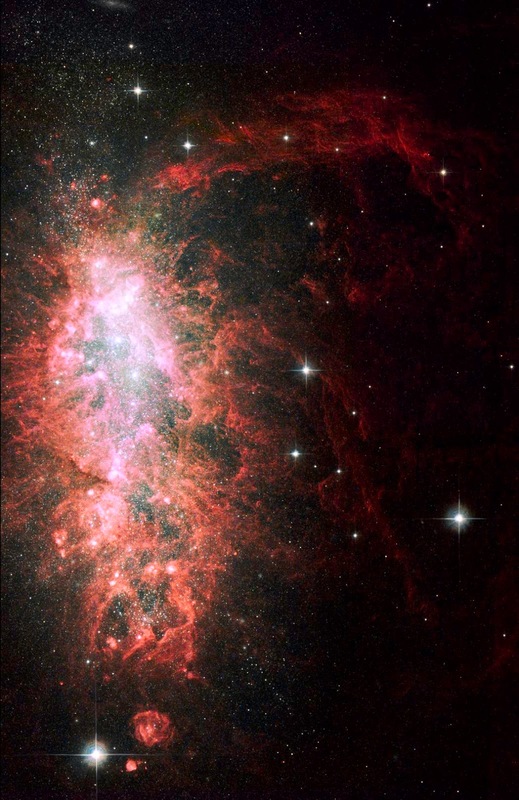 They were using Hubble's Advanced Camera for Surveys to hunt in NGC 1569 for the kind of red giant stars (stars near the ends of their lives) that shine because of fusion of helium nuclei in their cores. These stars are dimmer than bright red giants without helium burning, but when detected, they can be used to estimate the galaxy's age. "When we found no obvious trace of them, we suspected that the galaxy was farther away than originally believed," said Aaron Grocholski of the Space Telescope Science Institute and the lead author on a paper describing the results. "We could only see the brightest red giant stars, but we were able to use these stars to recalibrate the galaxy's distance." Bright red giants are reliable "standard candles" for measuring distance because they all shine at the same brightness. Once astronomers know a star's true brightness, they can calculate its distance from Earth. Previous estimates of the galaxy's distance made with ground-based telescopes were unreliable because they looked at the galaxy's crowded core and were unable to resolve individual red giant stars. The Hubble study observed both the galaxy's cluttered core and its sparsely populated outer fringes. The sharpness of Hubble's Advanced Camera pinpointed individual red giants, which led to a precise distance to the galaxy. Astronomers measured the galaxy's distance at nearly 11 million light-years away, about 4 million light-years farther than the old distance. "This was a serendipitous discovery," Aloisi said. "Hubble didn't go deep enough to see the faintest red giant stars we were hunting for because the galaxy is farther away than we thought. However, by capturing the entire population of the brightest red giant stars, we were able to calculate a precise distance to NGC 1569 and resolve the puzzle about the galaxy's extreme starburst activity."